No matter how you slice it, Bali is a magical place to be no matter who you are and what your travel style. There really is something for everyone and that’s why it’s one of those places I’d love to go back to. From great weather, laid back beaches, awesome surf, awe-inspiring rice paddies, luxury resorts and food to die for, I really could go on and on but if I were to pick 5 things a first-timer needs to go see, it’d be these places. One of the most memorable experiences of my trip to Bali was my visit to the region of Jatiluwih. Unfolding from the mountain, the beautiful and dramatic rice terraces cascade as far as the eye can see. The best part about here is that you won’t have to deal with large groups of tourists as it is relatively off the beaten path. If you’re lucky as we were with our driver in Bali, you’ll be able to stop by one of these paddies to meet local farmers and see what’s involved in harvesting rice. On the southwestern tip of Bali is one of the premiere spots to surf in the world. Even if you don’t surf though, there are tons of reasons to come here. For one, right at cliff’s edge is Uluwatu Temple and from here you get the most gorgeous views of the dramatic cliffs that line the coast and the shimmering Indian Ocean in the backdrop. Stay here into the night and you’ll be treated to Kecak and Fire Dance traditional show that is not to be missed. Surrounded by rainforests, Ubud is the cultural heart of Bali. If you want to get to know the real Bali, then you need to make sure you build in some time in your itinerary to Bali’s most iconic places. Now the area of Ubud is quite expansive but a few key places you’ll want to make sure you go to are Ganung Kawi with its rock cut shrines and the Sacred Monkey Forest Sanctuary where you’ll find mischievous macaque monkeys playing all over. Alongside some of these highlights, Ubud was memorable to me for its food, the local markets and of course the famous Barong Dance. Looking for things to do? Make sure to check out these 22 things to do in Ubud. You didn’t think I could go through this list without putting in something adventurous in here right? 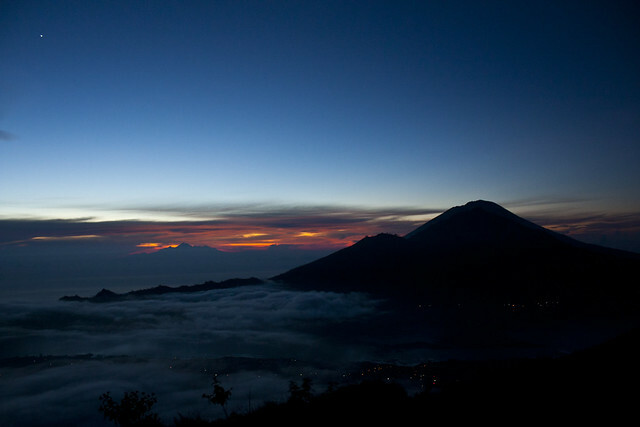 I highly recommend doing the sunrise hike up Mount Batur volcano. The views from the top are just stunning especially when you’re above the clouds and the sun starts to peek through and starts stretching its rays. The best part about it all is that it’s not like my Inca Trail trek which took days to do. This can be done by anyone of modest fitness level in 2 hours. During my trip to Bali, this was one of my favourite moments, not only for the out of this world photography I was able to do here but being able to enjoy the moment and take in the entire sunset from beginning to end. What’s fascinating to watch progress as the sun goes down is the rising of the tide. Eventually the water ends up covering all the ground surrounding the temple. So there you have it, my top picks for favourite spots in Bali. Remember, the best way to see Bali is to get a private driver to take you around or rent a scooter if you’re confident in your navigation abilities. Have fun out there! I absolutely loved all the insights u gave about bali. U r awesome as a travel blogger. keep up the good work. Awesome recommendations! I am planning to go Thailand one day, these places will definitely be in my list! Love all your 5 Top Must See in Bali, and for me Ubud is no 1 on the list, definitely. Fall in love too much with this Bali’s cultural heart. The rice paddies, the market, the royal palace, the organic food, the monkeys…:) And love the fact that even amongst lush green paddy fields and forests, there are still places you can still call slices of heaven…Love the post, Will! We are off to Bali, Lombok and Gili Islands in September. Cannot wait!! Make a note of your recommendations! Thanks! Awesome post! I’m heading to Bali in a few weeks time and can’t wait to check it out. These are some great suggestions for things to see. Thanks for the tips! Thanks Jenn! Oh I am so envious. You’re going to have a great time!